Most of us have used our Garmin sports devices on two different events and forgot to reset it between the events. Once you upload the file to Garmin Connect, it does look a bit odd on the map with a straight line between the two points, but the data otherwise is correct in terms of total distance. This use to be the case with Strava, but it seems that Strava has decided to make a change in how it handles the data upload from Garmin devices. 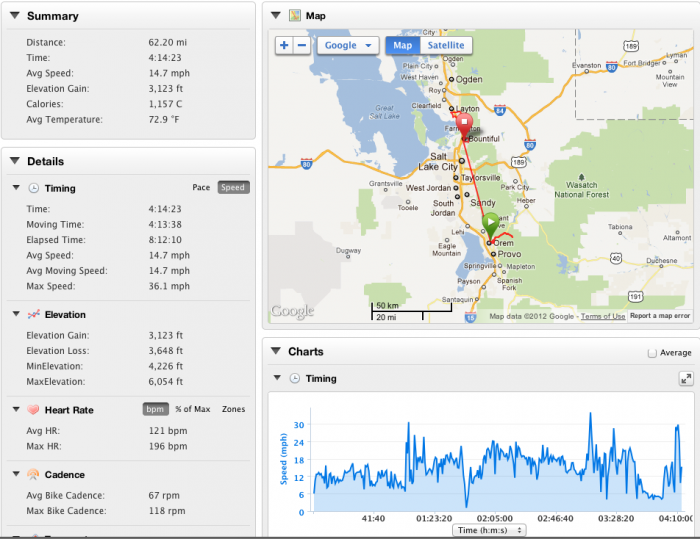 Instead of taking the data on total distance from the Garmin unit, it is using the individual GPS datapoints to generate the total distance. This means if you stop, or even shutdown, your Garmin device, drive to a new location, then start your second cycling event, Strava will add the straight line distance between the two. Because of comments on a friends Strava post about this subject, I decided to do a test. I did two bike rides and shut down the Garmin Edge 500 between the rides. It was about 40 miles (straight line) drive up to my brother’s house for the second ride. My total distance, as shown on the Garmin 500 was 62.2 miles and that is how things show up on Garmin Connect. However when I uploaded this FIT file to Strava, it shows 102 miles, which is totally wrong. I then split the file into 3 segments using another program, and uploaded the two real cycling segments into Strava. This shows how it looks in the Activity Summary on Strava. The first two lines are the two real segments, the last the full FIT file uploaded. Not only does Strava get the distance totally wrong, the time includes time when the Garmin unit is shut off. The suffer score no longer makes sense. Here is what it looks like on Garmin Connect. You can see the totals are correct and for most people that is all they care about. Not only is the total distance the sum of the fist two lines above but so is the time. I understand that Strava may want to try to do a better job at estimating distance but they have created a problem because most users will have no ability to split a FIT file to fix their mistake. Strava’s approach therefore does not make any sense to me and then need to fix this issue.